After the surgery, Melissa got to go to Disneyland with Curtis and his family for the Fall Break weekend. I could tell she felt a bit guilty leaving me right after my surgery. Of course, I didn't want her worrying about that and to have a good time. Erika was my right arm during my recovery in the hospital. She was there every day. She called me a couple of times a day. I knew she would come when ever I called her. She was and is an amazing woman. She helped my stay in the hospital less stressful. One important things I needed to do was be clean. If I'm sweaty and scummy I can't function (who can really?). The nurse came in with some warm clothes to give me the dreaded sponge bath. Erika jumped right up and took over. As she washed my back, I felt so much love for her. I realized that even little acts of kindness can bring people close to each other. She wasn't timid about it at all either. She washed my back and face with gusto! 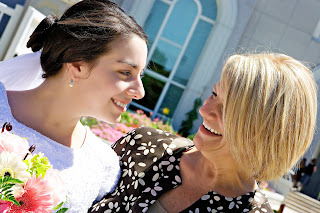 I was so appreciative of her and felt so very proud of my daughter. The next day, I was able to shower for real. I have a great picture of Erika all dressed up in her waterproof gown to help me with my first shower. She helped me in and out of my undies and gown. She washed my hair...really well I might add. 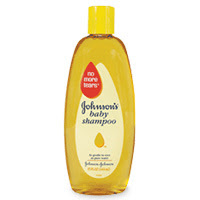 I felt so very clean after that shower. I'm most thankful to her for not laughing at my 45 year "old lady" body. She even lied and told me I didn't look that bad. She brought peanut butter, apples, applesauce, potato chips (I ended up eating all of them), and Puffin cereal. What a doll face. 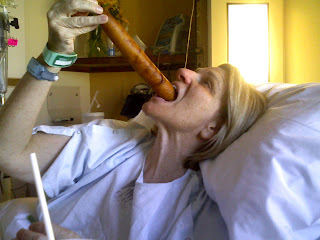 The BEST footlong corn dog in Utah! 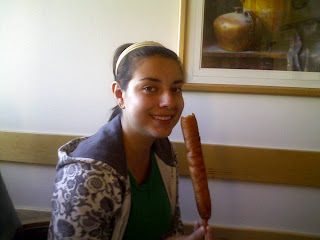 Erika with her delicious corn dog. If you ever have to visit the Utah Valley Regional Medical Center, get one of those. A.M.A.Z.I.N.G! So you can see how thankful I am for my darling daughter Erika and all the selfless love she showed me during my week's stay in the hospital. She never complained to me even once. I love you Erika. Thanks for the beautiful person you have become and always have been. WOW. . .What a girl! She's lucky to have a mom like you, and you're lucky to have a daughter like her. I'm glad that you survived the hospital, I can't wait to hear your spin on hospital food. I hope all is still going well. See you soon hopefully! You're making me tear up here, tami. We are all so proud of you, Erika, honey. What an amazing daughter you have! You both are very lucky to have each other in your lives. I hope you are feeling better. Wow mom! Thanks for that.. It made me all teary. I'm soooo glad that everything went well. I love you so much. Ps.. Why do I look so fat in the last picture? I need some serious weight watchers action..
P.S. 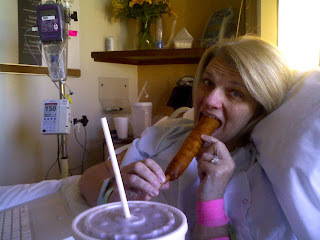 That is the largest corndog I have ever seen!! Good work, Mrs. Senneff. If i need surgery I'm calling you.